Carrot is among of my favorite root vegetables because it is claimed to be the perfect health food, along with its delicious taste. For the carrot cake, preheat the oven to 325 F. Grease and line a 9”x13” sheet pan. 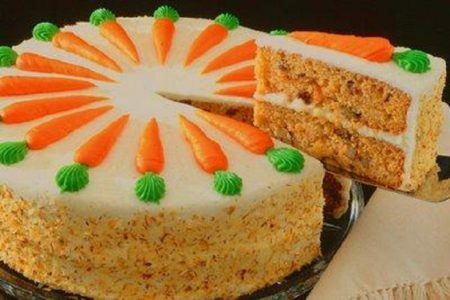 In a bowl, mix all of the ingredients for the carrot cake, except the carrots and walnuts, until well combined. Stir in the carrots and walnuts. Pour the mixture into the cake pan and bake for 1 hour, or until a skewer inserted into the middle comes out clean. Remove the cake from the oven and set aside to cool. After a few minutes, remove the cake from the pan and set aside to cool completely on a cooling rack. To make the icing: Beat the cream cheese and butter together in a bowl until creamy, then add the confectioners’ sugar and beat for a minute. Spread the icing over the top of the cake with a palette knife.